Nuneaton maintained their push towards the automatic promotion spot in the Conference Premier with a narrow 1-0 victory at Hereford. 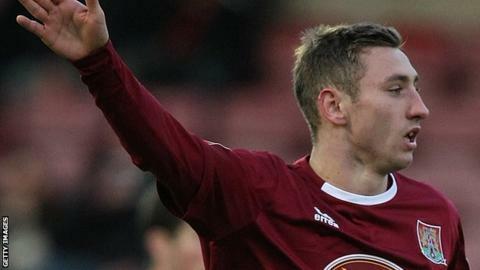 Louis Moult scored the only goal of the game from the penalty spot five minutes before half-time after Frankie Artus fouled Wesley York. Hereford rarely threatened, but worked Nuneaton goalkeeper Kelle Roos with efforts from Artus and Eric Odhiambo. Moult missed a chance to double the lead but Nuneaton held on to go fourth. Match ends, Hereford United 0, Nuneaton Town 1. Second Half ends, Hereford United 0, Nuneaton Town 1. Offside, Nuneaton Town. Dave Hibbert tries a through ball, but Dave Hibbert is caught offside. Substitution, Nuneaton Town. James Armson replaces Louis Moult. Attempt missed. Dan Walker (Hereford United) right footed shot from outside the box. Substitution, Hereford United. Cory Williams replaces Eric Odhiambo. Offside, Hereford United. Dominic Collins tries a through ball, but Dominic Collins is caught offside. Attempt missed. Dave Hibbert (Nuneaton Town) header from the centre of the box. Assisted by Danny Sleath with a cross. Substitution, Nuneaton Town. Freddie Ladapo replaces Wesley York because of an injury. Attempt missed. Josh O'Keefe (Hereford United) left footed shot from outside the box. Offside, Nuneaton Town. Danny Sleath tries a through ball, but Danny Sleath is caught offside. Foul by Micah Evans (Hereford United). Phil Trainer (Nuneaton Town) wins a free kick. Substitution, Hereford United. Dan Walker replaces Frankie Artus. Attempt missed. Dave Hibbert (Nuneaton Town) header from the centre of the box is too high. Wesley York (Nuneaton Town) wins a free kick. Offside, Hereford United. Michael Rankine tries a through ball, but Michael Rankine is caught offside. Josh O'Keefe (Hereford United) wins a free kick. Attempt missed. Louis Moult (Nuneaton Town) right footed shot from outside the box misses to the left. Attempt missed. Adam Walker (Nuneaton Town) left footed shot from outside the box from a direct free kick. Foul by Luke Graham (Hereford United). Foul by Eric Odhiambo (Hereford United). Attempt saved. Eric Odhiambo (Hereford United) left footed shot from outside the box is saved. Attempt missed. Gareth Dean (Nuneaton Town) header from the centre of the box is too high. Assisted by Adam Walker. Attempt saved. Wesley York (Nuneaton Town) right footed shot from outside the box is saved.